Amazing kids Halloween games and activities. ...that wise man, Ladies & Gentlemen, is none other than your own friend…Myself! 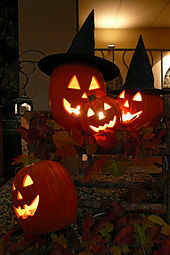 Halloween is typically linked to the Celtic festival of Samhain. It has long been thought of as a day when the dead can return to the earth and ancient Celts would light bonfires and wear costumes to ward off these roaming ghosts. Halloween also marks the end of summer and the onset of winters. Novelty candies shaped like skulls, pumpkins, bats, worms etc. So what are we waiting for? Let’s celebrate Halloween with the following Kids Halloween Games! Game Objective: In this kids Halloween game kids have to touch and feel the contents in the cauldron. No. of Players: A group of 5-10 kids. Handkerchief to be used as blindfolds for each player. Some plastic open top pumpkins or plastic bowls from kitchen. Add more ingredients from your imagination using similar household stuff. Put all the above items in separate bowls in sufficient quantity. Make the kids sit in a circle. Keep the ambiance spooky by playing scary music or tell a horror story in the background. Instruct the kids to be silent and patient till the game ends. Pass on the first cauldron to the kids. The first kid will dip his hands inside the cauldron and feel the content and then passes on to the next one. Once the cauldron gets circulated in the circle announce what part of the corpse it was. Similarly pass on all the cauldrons one by one. It is fun to watch kid’s reactions every time you declare the content of the cauldron at the end of each round. When the game is over display all the items in serial order. The kids will be amused to see the actual content of the cauldron. Game Variations: Once the game is over and the blindfolds comes off, hide all the cauldrons and keep the reality a mystery to the kids. Depending on the item, it can be either mildly heated or kept cold. This will make the overall experience spooktacular!!! Game Objective: This kids Halloween game is similar to bobbing for apples but with a twist. No. of Players: A group of 6-8 kids. A pack of green slime. Packed candies in skulls, pumpkins or worms shape. Fill up the cauldron with the green slime. Mix the candies in the slime evenly. Pass on the cauldron to the kids. See them poking their hands hesitatingly into the cauldron and taking out a Halloween candy for themselves. Instead of green slime try to use your favorite Jell-O jellies of any flavor of your choice. Li’l ones might get tempted to lick their hands clean instead of washing it! Game Objective: In this kids Halloween game kids have to race to the end after finishing a task. Game Learning: Coordination and speed. No. of Players: 6-10 kids. Some rolls of toilet paper. Mark Start & Finish line. Teams will stand behind the Start line. Give a new toilet paper roll to each team. Each team chooses a Witch and a Mummy. Witch of each team has to wrap her Mummy with the toilet paper from head to toe in 2 minutes. Blow a whistle at the end of 2 minutes and all the mummies will race towards the finish line without tearing off the toilet paper. Incomplete Mummy will be disqualified from the race and the Mummy who crosses the Finish line first with its wrap intact WINS this kids Halloween game! This interesting kids Halloween game can also be played in a Birthday party, especially for grown up kids who demand some challenging yet fun games for them. Game Objective: In this kids Halloween game kids have to be alert all the time. No. of Players: A group of 5-8 kids. Just the kids squeals & nothing else! Make the kids stand in a circle. A kid will start the game by saying “Mikrey”. That kid simultaneously has to point a finger to any other kid in the circle by fully extending his arms and making eye contact with him. This kid now has to say “Dokrey” to some other kid in the circle exactly the same way. That kid will in turn say “Pakrey” to any other kid in the group exactly the same way. This sequence of “Mikrey – Dokrey – Pakrey” will continue until a player makes one of the following mistakes and gets out of the game. Elimination Mistakes – saying the word in wrong sequence when pointed, pronouncing the word incorrectly, taking too long to react, saying without getting pointed, not making eye contact while pointing and not pointing properly. Continue to play until one kid is left who is the winner!!! Try playing this game as fast as possible. It will be more fun! A neutral game that can blend with any kids party theme. Game Objective: In this kids Halloween game one has to toss as many candies in the Pumpkins. Game Learning: Throwing & Taking Aim. No. of Players: As many as you can manage. 6 open top plastic pumpkins varying from small to large size. Individual wrapped Apple candies or corn candies. Arrange all the pumpkins like bowling pins with large ones at the front and small one at the back. Allocate 5-10 candies per kid. Kids will take turns to throw all the candies into the pumpkin from the starting line. Set the distance between the pumpkins & the starting line keeping kids age group in mind. More points for throwing balls into the smallest Pumpkin or the farthest Pumpkin. Kid with maximum points WINS this kids Halloween game! This wonderful kids Halloween game can be played as a birthday party game by replacing candies with a soft ball or tennis ball and Pumpkins with regular boxes or empty cans at home. Game Objective: A kids Halloween game where kids have to pin the crooked noose of the witch. Game Learning: Direction sense & imagination. No. of Players: Everyone at home! Stick the Witch’s poster on the wall. Turn the child in a circle once. Let him go ahead and stick the crooked nose on the poster. All the kids will take turns to do the same. Kid who has placed the nose closest to the actual position WINS this evergreen kids Halloween game! This evergreen kids Halloween game can be played as a birthday party game like pin the Hat of the Pirate! Or pin the magic wand of Harry Potter!!! Game Objective: A kids Halloween game where kids have to do one thing they like the most… SCREAM! No. of Players: All the kids in the party. Make the kids stand in a line. Turn wise the kids have to give his/ her best spookiest… scariest…& horrendous screech. The judges will give points to every scream. Playback the video recording to listen to the winning scream. Age Group: 4 to 8 years. Game Objective: A kids Halloween game where kids have to pull their strongest spit to win. Dry & clean Pumpkin seeds. The kid with the farthest distance from the start point WINS!!! this nice little kids Halloween game. Game Objective: A kids Halloween game where kids have to make a scarecrow in a team. Some old Full sleeves shirts. Some old worn out jeans. Some worn out boots or shoes. Some old worn out hats. Plenty of old news papers. Plenty of strings to tie. Some wooden sticks to form the structural base. Some Pumpkins for the head. Divide the kids into small teams of 4 or 5. Keep all the above material at a central place. Set the time limit for 15 minutes. Appoint a couple of judges among the adults. Set the theme as the most scariest or the funniest scarecrow. Once the time is over the best scarecrow judged by the judges WINS!!! To encourage the kids and appreciate their efforts, make all the family members click a group photograph around the winning scarecrow. Game Objective: A kids Halloween party game in which kids have to hunt for the Wicked Hat of the Witch. Game Learning: Fun on the Run! No. of Players: All the Li’l ones. Some same colored construction paper or chart paper. Draw and cut out plenty of Wicked Hats of Witch by using the same colored construction paper. Draw and cut out one Wicked Hat by using a different colored construction paper. Hide all of them throughout your house. Tell the kids that each of them have to hunt 5 hats (of the same color) and the kid who finds that one different colored hat will WIN!!! 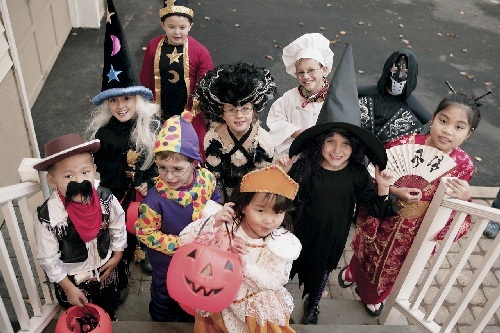 This kids Halloween game is a great ice breaker activity that will set the party rolling! A pack of jelly worms candy or gummy bugs candy. Empty Pie pans (one for each player). Mix equal number of jelly worms or gummy bugs candies with the whipped cream in separate Pie pans (one for each player). Make all the kids stand around the table in front of their respective Pie pans. Set the time limit for 2 minutes. As the time starts ,with hands folded behind their backs the kids have to eat as many bugs as they can find in the pie using only their mouth. After the time is over count the bugs and the kid who has eaten the maximum no of bugs WINS!!! Instead of eating the bugs kids have to spit them on the table next to their pie pan without biting or chewing it. The kid who has hunted maximum number of bug will Win! Kindly visit our collection of Kids Party Games ideas for Easter Games for Kids, Birthday Party Games & Christmas Party Games… Now!